In this lesson, students will learn about the “other” carbon, that is, inorganic carbon and how it is important for understanding how mountains erode over millennia, how farmers utilize it to maintain soil health, and its role in the carbon cycle. This lesson will introduce students to the scale at which ecosystem ecology works. 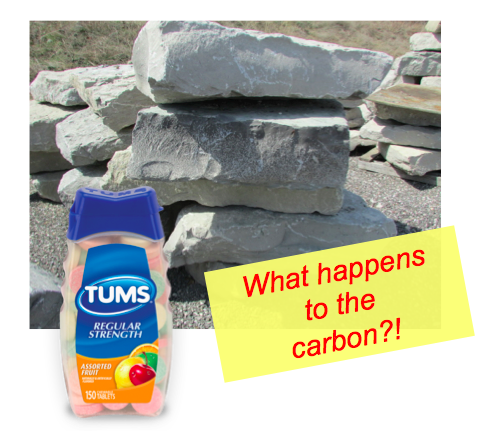 A small lab activity demonstrates the chemical reaction at the heart of this lesson (involving TUMS, hence “inorganic carbon cycling in your belly”). The lesson involves working with a scientific journal article and data from it. The journal article illustrates how scientists quantify how humans affect the ecosystem, more specifically, how the inorganic carbon in the river water tells a story about how humans use the land. Together, we walk through a series of graphs from the paper to arrive at conclusions by synthesizing information from multiple graphs. Then we break into pairs, make predictions, graph more real data from the article, and discuss the results as a group. Describe the scale at which ecosystem ecology works. Explain the difference between organic C and inorganic C and their cycles. Explain what geological weathering is. Describe the chemical reaction when carbon (C) in TUMS (CaCO3) is added to vinegar and how this relates to the environment. Explain the role of agricultural liming in buffering soil pH. Synthesize conclusions from a sequence of different graphs. Make predictions of river alkalinity export based on % crop or % forest area in a watershed.